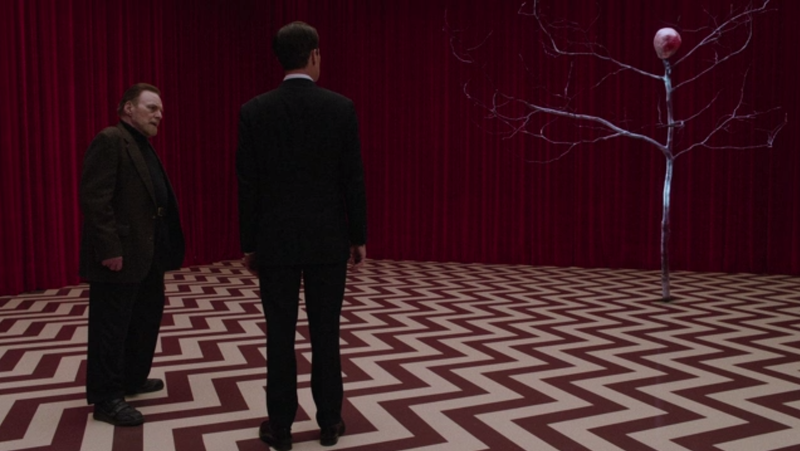 At 2am on Monday the 22nd of May I raised my cup of Damn Fine Coffee and re-entered the realm of Twin Peaks. There was a deep humming noise. There were incomprehensible scenes of nothing happening, followed by scenes of nothing comprehensible happening. There were heart-warming appearances from old acquaintances. There were several harrowing deaths. And there was coffee. Early on, Frost and Lynch murdered any prospect of a puppy-love plotline. Two young lovers were introduced: an attractive young barista and her suitor. She grinds coffee, he guards an ominous glass cube surrounded by cameras in a sinister military/scientific bunker. After he smuggled her into the bunker, they canoodled on a couch. Just as things were heating up, a terrifying interdimensional death-blur burst out of the cube and ripped their bodies to bloody shreds. And that’s the last we’ll be seeing of them. But before that, there was opportunity for an ironic dig at our own viewing experience. We sat and watched a box on which people sat and watched a box. They didn’t know what it was they were watching for, only that it made them uneasy. Us too, kids. Welcome to Lynchville. Lynch and Frost have gathered almost 40 members of the original cast, and numerous supporting characters appeared here, thrilled to be back. 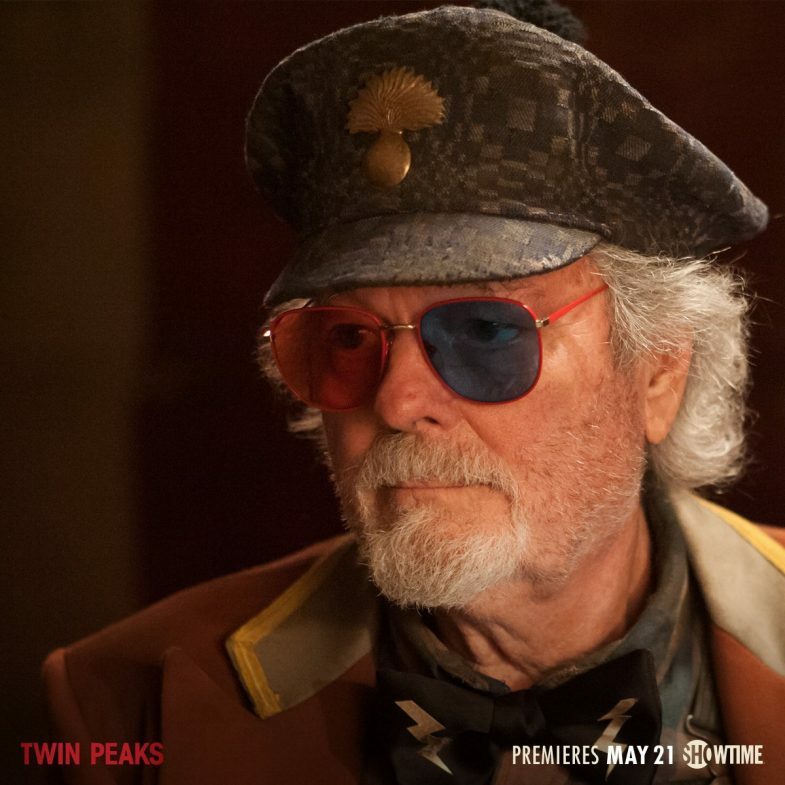 First up was eccentric Hawaiian shrink Dr Jacoby (Russ Tamblyn), once Twin Peaks’ foremost psychiatrist and Laura’s creepy confidant, living in a bivouac in the woods and buying lots of shovels. What are they for? And why does he still wear those red-and-blue 3D glasses? Kimmy Robertson remains funny as ditzy police station secretary Lucy, assisted by Harry Goaz as her nice-but-dim lover Deputy Andy Brennan. They’re the show’s best double-act, but face strong competition from the brothers grim: Ben & Jerry. 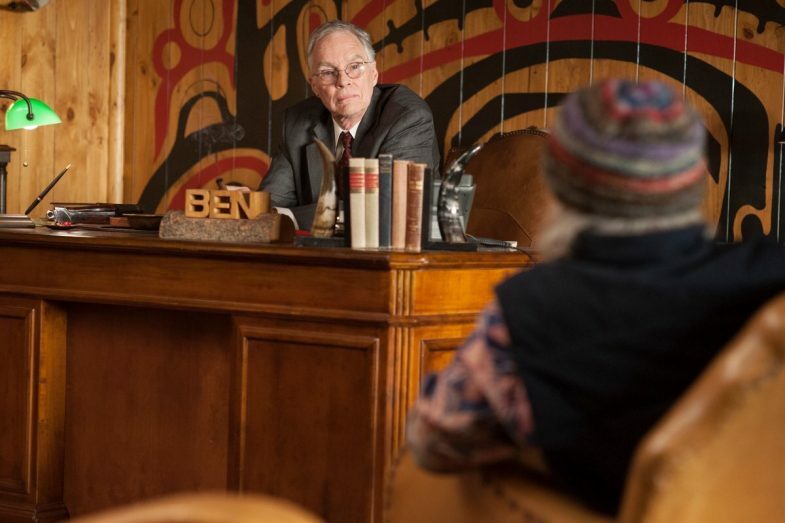 Cigar-chomping real estate magnate Ben Horne (Richard Beymer) shot the breeze with his party-loving younger bro (David Patrick Kelly), now helping to fill the family coffers with a legal marijuana business. Personality-wise, the duo haven’t changed, although beardy Jerry now looks like a stoned Father Christmas. 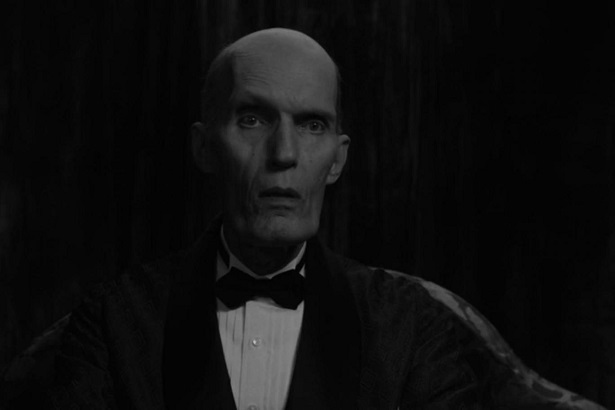 Carel Struycken has aged like a fine wine. Reprising his role as a nameless prophetic giant, the 68-year-old looked dapper in the monochrome opening scene. Cocking his eyebrow in a dinner jacket and bowtie, he spouted cryptic metaphors like a voodoo Len Goodman. “Two birds with one stone”. Paunchy, middle-aged detective Dave is having a rough day. He’s just discovered a dead body, and it belongs to two people: a woman’s decapitated head, resting above a hairy, obese man’s body. Perhaps that’s what the giant meant by “two birds with one stone”. Twitchy school principal Bill Hastings has his fingerprints all over the crime scene, and he seemed untrustworthy in a claustrophobic interrogation sequence. Matthew Lillard’s bug-eyed, sweaty performance as Bill deserves a round of applause – in particular, his feral anger when confronted by his wife in the prison cell. We don’t know for certain whodunit, but Evil Cooper (Bob), is involved. Possession doesn’t suit Dale Cooper. Since Bob took his body, the demon has taken little care of it, and Dale’s perfect hair now hangs long and greasy. Oh, and he’s murdered several people: his ghastly slaughter of a youthful female accomplice–toying with her and terrifying her for the hell of it–was uncomfortable viewing. It shared the Lynchian nastiness of Blue Velvet and perhaps had some viewers reaching for the remote. All true Twin Peaks fans know: the celebrated dancing dwarf played by Michael J Anderson, and known to Twin Peaks fans as The Man from Another Place, is in fact not a human being but an animated arm – the missing left arm of Bob’s beardy nemesis Mike (also a demon, but a less troublesome one). And now he has “evolved” into a skeletal tree, with a pulsing mouth-brain at the head. Oh, and that tree has an evil doppelgänger. This episode was dedicated to two cast members: Frank Silva (who played Bob, and died in 1995), and Catherine E Coulson, who played Margaret “The Log Lady” Lanterman. Coulson passed away after performing her scenes for this series, and was a fragile figure on screen here. 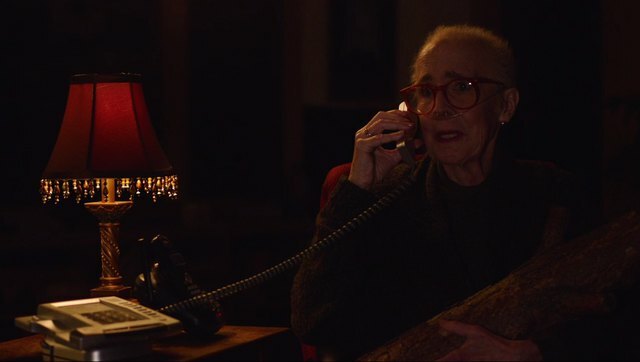 The Log Lady was, the spiritual heart of the original Twin Peaks: in contact with the mysterious land just beyond the forest, a character both peculiar and tragic (she was still in mourning her for a husband who died in a fire). Through Coulson’s committed yet understated performance, the log–which “speaks” to her and reveals eerily accurate prophecies–became a character in its own right, both playful and serious at once. 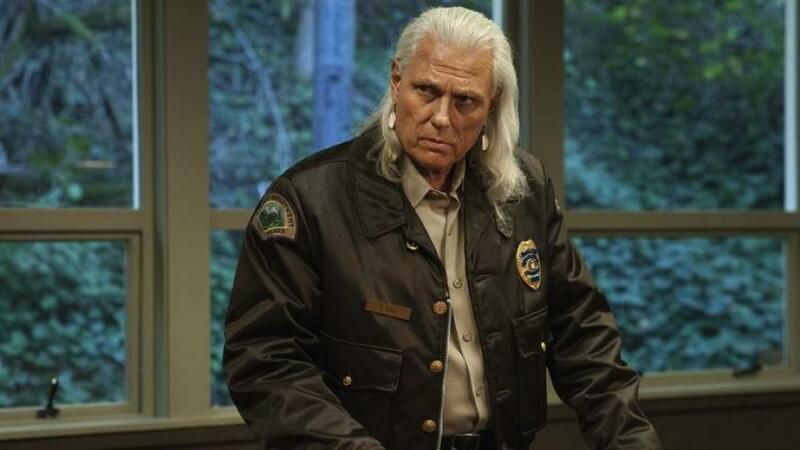 Her late-night phone call to the silver-haired Deputy Hawk (Michael Horse), a quiet moment between two old friends, brought a lump to my throat. It also advanced the plot, as her guidance helped Hawk to find the oily puddle that leads to the Black Lodge, which–we were told–Bob will be dragged to. For the obligatory cabaret-song performance (a requisite-tick box in everything by Lynch) we were back in the original show’s Bang Bang Bar, where we ran into a few more familiar faces. Former teen rebel James Hurley (James Marshall) is now “quieter”, after a motorbike accident which has had a lasting impact. Across the bar, he caught sight of his old friend Shelley Johnson (Mädchen Amick). Their eyes met, and fans around the world felt 26 years slip away in an instant. Who knows what the rest of the series will reveal. But I have a feeling it will be a place both wonderful and strange. I was so confused! Former fans will watch, but it is unwatchable to a new viewer. The original series grew on me, I am hoping this one will too.